67 photos and over 110 pen-and-ink drawings and cartoons. Scroll down to see how to buy the book. This is the story of the good ship Mollymawk, and of how she was built, and where, and why. If Mollymawk had been built in a friend’s field or in a shed, in the ordinary way, there would have been nothing much to say – except, “Here’s a good design for a cockpit,” and “Don’t forget to sand-blast” – but as it is she was built on a South African farm, and in a small harbour just east of the Cape, and on the windswept desert coast of Namibia, and in the remote island of St Helena, and in the Cape Verdes, and in Spain… and so on. 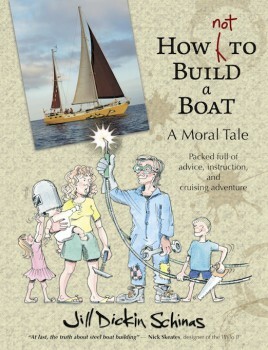 As a result, How NOT to Build a Boat is a DIY instruction manual, a travelogue, and – at times – a comic tragedy, all rolled into one. Copious illustrations, diagrams, and photographs ensure that even the most complicated piece of engineering can be understood by all, and Jill’s observations and anecdotes, combined with the cartoons scattered here and there throughout the book, ensure that the account never gets too heavy. After Mollymawk was launched, we moved aboard and began to cruise in our unfinished home, and the continuing saga of the boat-building adventure is presented against a colourful backdrop of cruising tales. 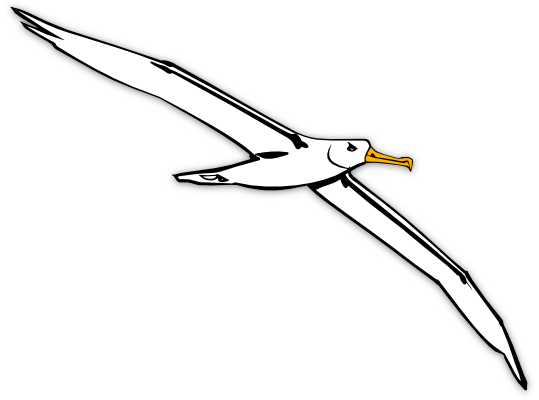 Besides describing the perils of welding from the rubber dinghy and the difficulty of insulating the hull-sides whilst three small kids are clambering about the cabin, the book also records anchoring dramas, visits to an isolated penguin colony and to the antique British colony of St Helena Island, tells how we cured our compass of pointing always at the bow, and describes in gory detail the ordeal of sailing a half-built boat in heavy weather. For more information see Jill’s website or the publisher’s website. If you buy the book via us, we’ll earn more money – but you’ll have to be a little patient if we’re at sea. Alternatively, you can follow these links to Amazon UK or Amazon US.